Yesterday I had a pleasure to play against Skrzyp, one of the most experienced RoS player in Poland. Skrzyp won the roll and choose the side, I went first. Pygs and one unit of Bears went on ambush duty. Jarl, thanks to Runebearers Harmonious Exaltation, put all his 3 upkeeps: Reposition 3” on the stone unit, Pathfinder on Champions and +2 Def and Speed on Raiders, then walk. Stone awakens for one and moved forward. Rest of the forces just run into positions. Skrzyp put Inviolable Resolve on Defenders and Admonition on Hemera. He also shot off the table some Raiders. On my second round I ambush Pygs from the left and shoot at Archers killing one. Left Bomber thanks to nice ddeviation killed another Archer. 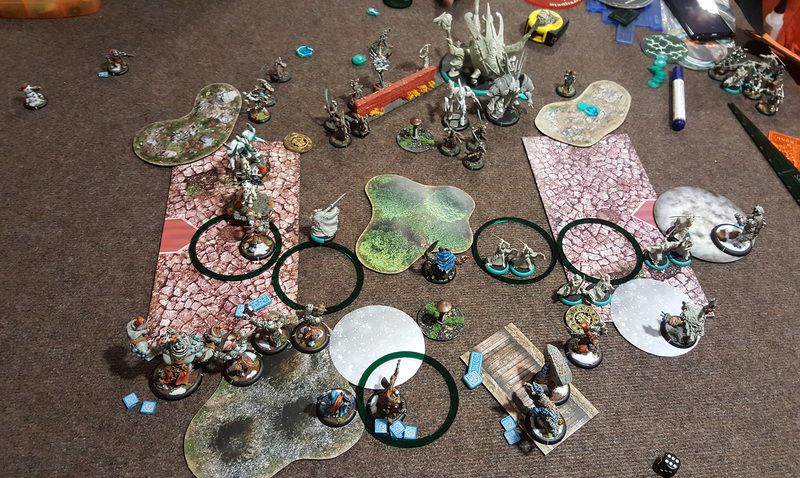 Jarl with his pistols and Magic Bullet shot down Eiryss and one Nyss Hunter. I also FEATed. 2 Champions went to the cloud in the left zone to take the first hit. One bear to the right run as a bait. I put Valka and Fell Caller on my flag. Right Bomber park at the edge of right zone. And now RoS – Skrzyp FEATed and it was devastating 🙂 His forces ignored clouds and stealth, also they got additional die on hit and dmg (discarding one). 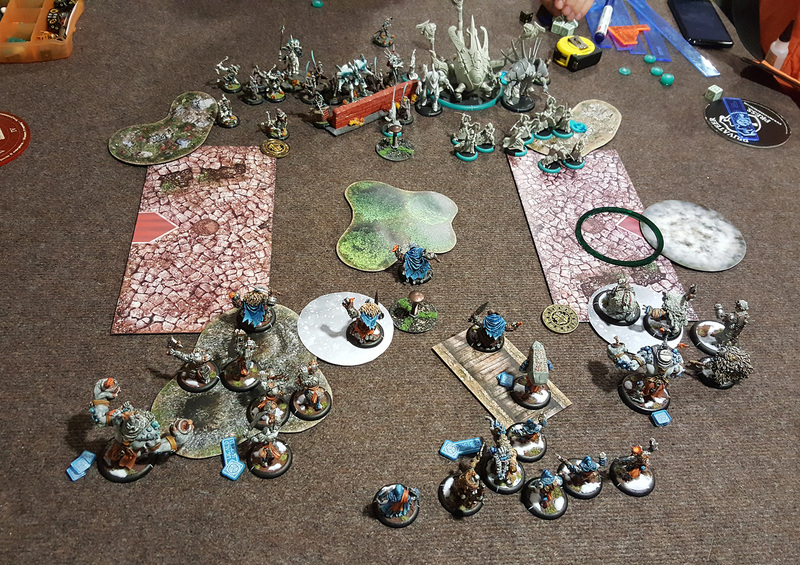 Issyria put Blinding Light on the left Bomber, so he couldn’t shot next turn. Battle engine with Hemera got rid of the right Bomber with just 3 shots total! 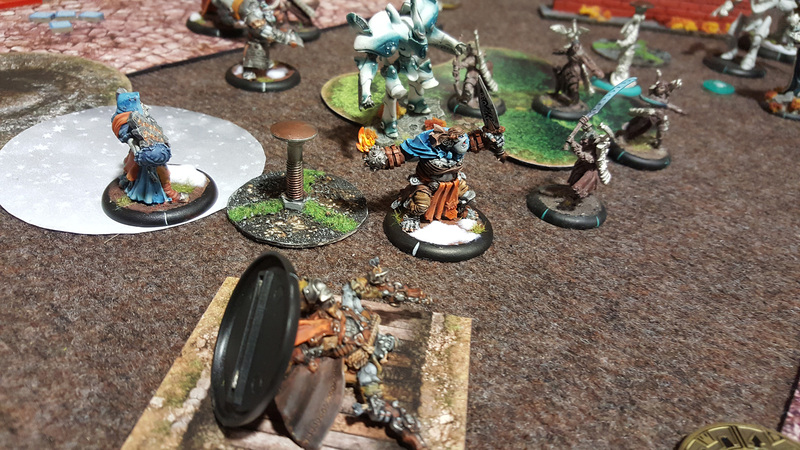 Ryssovan Defenders charged Valka, killing him, and engaging Fell Caller. Archers killed 2 pygs. Cylena and/or Harpy shot 2 Stone Members and damages Champs. Fane Knight charges Champions as well as one Defender, leaving 4 Champions on 1 box each. Noone scores. 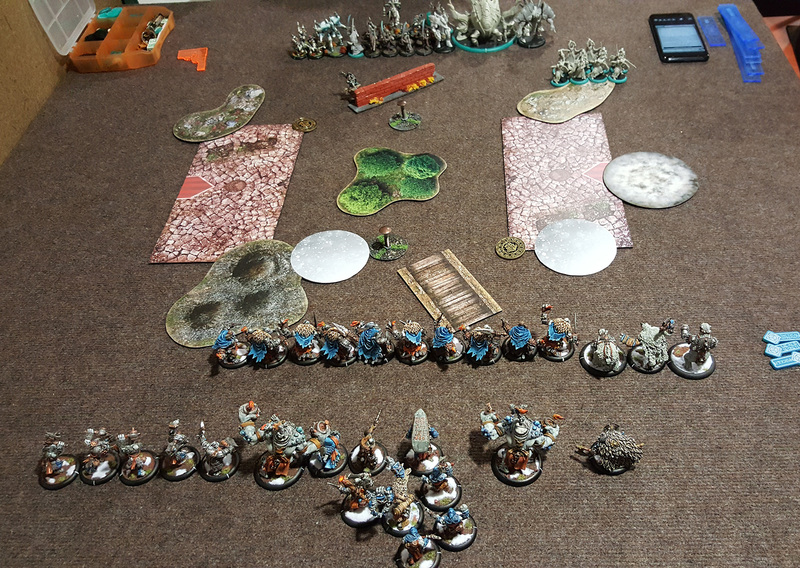 Trolls turn 3. I ambush Bears and run them in the back of RoS forces. Champions dismount Knight and killed 1 or 2 Defenders. Bomber derps in the zone. Jarl missed one shot on Defender and another one toughed. Fell Caller killed 2 guys. Pygs shot some guys down. RoS slowly grind through my remaining forces. He puts Blinding Light on Jarl and Bomber. 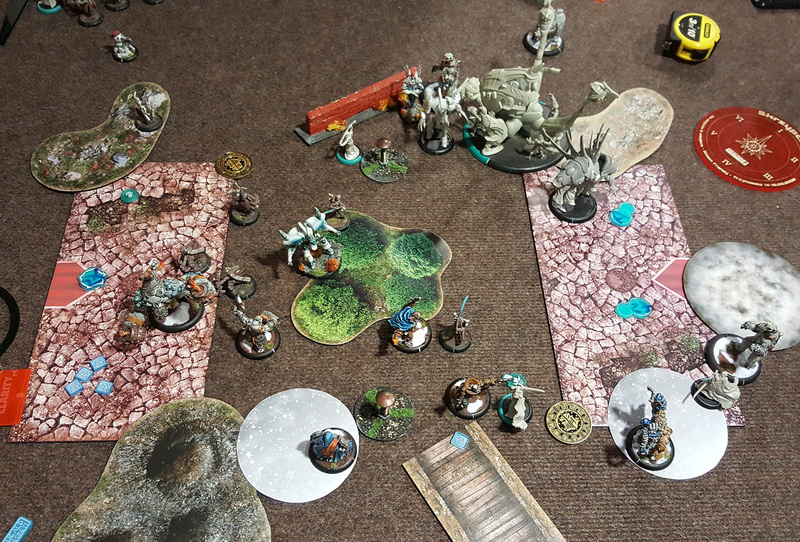 Battle engine hit Bear Handler with Momentum and slammed him in the table edge – we were not sure how to solve this – is Handler removed from play? Or is he treated as one hitting obstacle? Or is he just stops? Anyway – he just died to basic damage roll 🙂 Stone guys died. Hemera scored 1 point in the zone. Bears just run to engage Issyria. 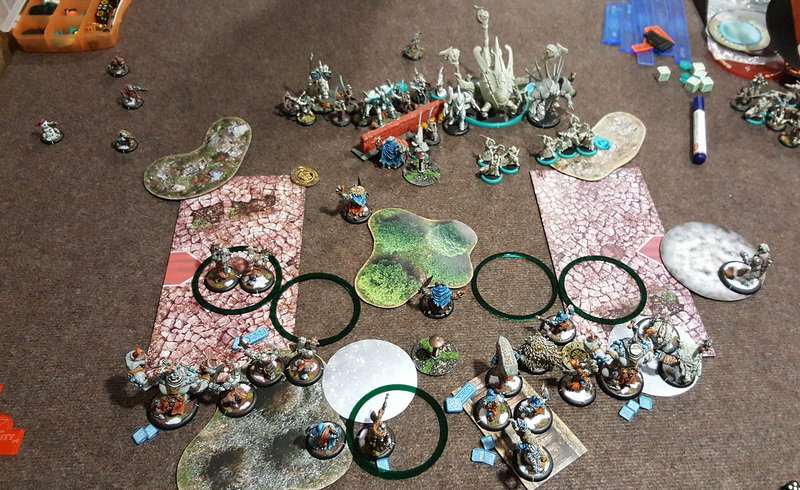 Pyg shoot at Sylys, killing him 🙂 Jarl charges some warriors and killed them. 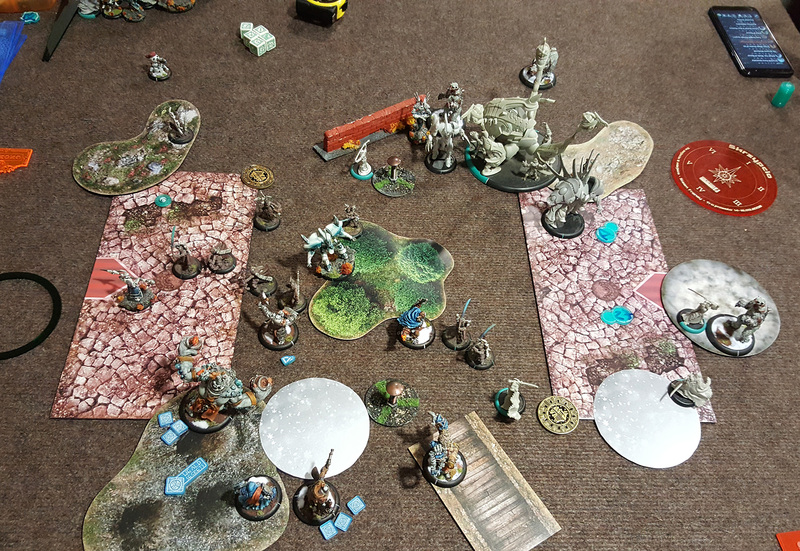 Bomber charged Fane Knight and Nyss, killing them. 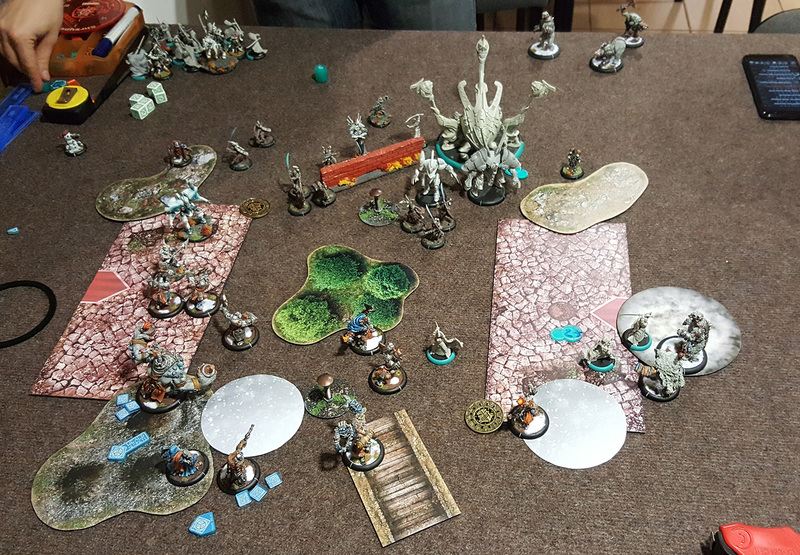 Skrzyp in his next round easily killed Jarl using his shooting forces, even missing him once (Jarl dodged to trench, but didn’t survived). Next Post:Let’s start with… ?